Hamburg’s water plant is among the latest victims of the floods of 2019. 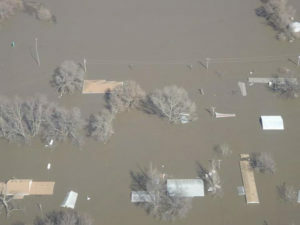 City officials were forced to shut the plant down Sunday night after floodwaters spread into the community. Fremont County Emergency Management Coordinator Mike Crecelius says critical problems developed when water overtopped the famed “Ditch 6” levee — a focal point of the 2011 flooding. Hamburg officials are asking residents not to flush their toilets, and they’ve expressed fear the city may run out of water within 24 hours. Crecelius says he hopes to secure a tanker truck for Grape Community Hospital in Hamburg and to secure water pallets for residents. Officials are also monitoring developments in Thurman, which was evacuated early Sunday after floodwaters inched closer to the community. “There is some overtopping and another breach,” he says. “That’s all going in the direction of Percival. Ultimately, all of this will be on the outskirts of Hamburg just like it was in 2011.” Shelters in Hamburg have been relocated to nearby Sidney, Tabor and Shenandoah.